MENLO PARK, Calif., July 9, 2018 /PRNewswire/ -- Money really does talk, suggests new research from staffing firm OfficeTeam. More than two in five workers (44 percent) said they'd leave their job for one with better pay. Among professionals in the 28 U.S. cities surveyed, those in Des Moines, Cleveland, Philadelphia and Salt Lake City are most attracted by a bigger salary. In terms of gender, 47 percent of women would resign if offered more money elsewhere, compared to 40 percent of men. Whatever the reason for leaving, employees should have a good exit plan when parting ways with a company. In a separate survey of HR managers, 83 percent said the way someone quits affects their future career opportunities. 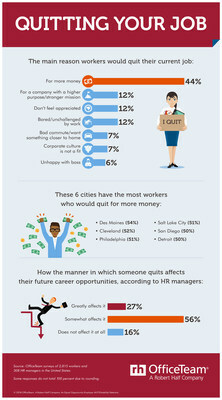 View an infographic about quitting a job. "Employees want to be compensated fairly and feel challenged and fulfilled in their jobs," said Brandi Britton, a district president for OfficeTeam. "If higher pay is the primary reason for considering another position, professionals should first see if there is an opportunity to discuss a wage increase in their current role. Employers may be open to negotiation if it means keeping a good worker." Britton added, "When an employee decides to leave a company, exiting on good terms is a must. You never know when you might encounter a former colleague later in your career." Think carefully through the pros and cons of leaving. Have another position lined up first. Schedule a meeting with your manager to discuss your resignation before alerting coworkers. Try to give at least two weeks' notice. Tie up loose ends on projects. Offer to help with the transition during your final days. Thank colleagues and exchange contact information with those you'd like to keep in your network. If an exit interview is offered, provide constructive feedback in a professional manner. The surveys were developed by OfficeTeam and conducted by independent research firms. They include responses from more than 2,800 workers 18 years of age and older and employed in office environments in 28 major U.S. cities, and more than 300 HR managers at U.S. companies with 20 or more employees.